Description: BNSF Fort Worth Subdivision between Ponder and Justin - Z-WSPALT9-06B. Description: A westbound NS Triple Crown trailer train slowly passes my location. Description: NS 9084 and BNSF 500 fly through Martinsburg, MO with a roadrailer train in tow. Description: A NS roadrailer passing us at about 60 mph. BNSF 500 helping. Title: BNSF 500 leading the local. 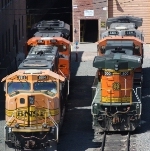 Description: Three BNSF Heritage roll by the Amtrak Depoy in Omaha. Description: BNSF #500 Leading The Southbound Local in Centralia IL. Description: The L-CHI101 had yucky power today. Description: A CLOUDY DAY AT PECK PARK. IT IS REALLY HOT OUT THERE! THIS IS A LITTLE TOO BACK-LIT BUT A GOOD 500 CLASS SHOT. Description: Local power waiting for its next assignment. Description: M-GALCHI w/ a usual boring Dash 8 consist. Description: Class B40-8W #500 awaits its return to duty Monday morning. Title: BNSF 553, BNSF 500, BNSF 2783, BNSF 2356, BNSF 3135, & BNSF 2391 smoking up a storm!